We challenged ourselves to create a traditional Oriental design that looked real, had lots of detail, and was simple enough to fit into the small area of a fan lamp. A big challenge! But Glass Eye 2000 made the challenge much easier. 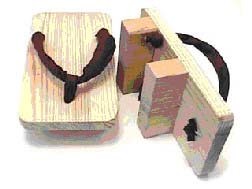 For our theme we chose "geta" which are Japanese sandals on an elevated wooden base held onto the foot with fabric. They are worn with traditional Japanese clothing, usually without socks, to keep the foot well above the ground. A fan lamp is small and has to fit its base exactly. It requires a template, an outline drawn to the exact shape and size needed. Glass Eye 2000 makes this step easy. If we wish to, we can start with a photo and draw our template on top of it. We can save all of our templates for various shapes and sizes in one folder, and then copy/paste the template into a new design. Once we had drawn the geta, and made sure the design was the correct size to use with our lamp base, we were ready to print and start laying out the pattern on the various colors of glass. Some of the pieces in our geta fan lamp are small, and others are thin. We love detail and realism, and we're willing to suffer some to get great results. We cut, grind and foil (and sometimes re-cut!) those tricky pieces carefully, hoping for a beautiful result. Varying densities and colors of glass are chosen to achieve a 3D effect with shadowing. We also use very, very narrow foil widths. This lamp was foiled using 11/64" and 5/32" foil to achieve lovely, narrow solder lines. The geta design is one from our collection Orient Express…ions which we created with Atelier Studio in Lancaster, Pennsylvania. 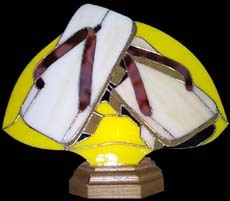 The collection also includes designs for stained glass windows and mosaic stepping stones. We chose to include the geta pattern as a quick project for someone who wants to represent traditional Japan in a simple and lovely way. It basically "says" Japan. We offer all of our full-size designs in three formats: .eye,	.jpg and .tif. The .eye format is the most versatile, as patterns in this format can easily be resized, reshaped, and recolored. Consequently, people all over the world have adapted Glass Eye 2000 for stained glass, woodworking, enamel, and other media. You can also get really creative — adding geishas and deleting samurai — with minimal time and effort. Glass Eye 2000 gives you the tools to get incredibly accurate measurements for your windows and projects, and to have oodles of fun changing the colors of kimonos and sunsets. If you're concerned that you've resized your window too small and have created impossible-to-cut tiny pieces, you can ask the program to point out pieces that might be too small to cut and then readjust your pattern accordingly. Paned Expressions Studios opened in 1979 and has been creating patterns and custom finished glass art commissions throughout the years. They have always felt that stained glass is fine art and not only a craft and this attention to detail shows in their work. In windows, mosaics, fired paints, and etch/carve, they strive to achieve the realism that is the signature of their creations. In 1997, their talents became available to other studios and to hobbyists through their custom pattern design service. In 2003 they began compilation of many of their designs into pattern collections and currently have 21 collections for sale on CD.